Telangiectasias the medical term for spider veins are bunches of small blood vessels that progress close to the surface of the skin. They are recognized by their color, which is usually red, blue, or purple. 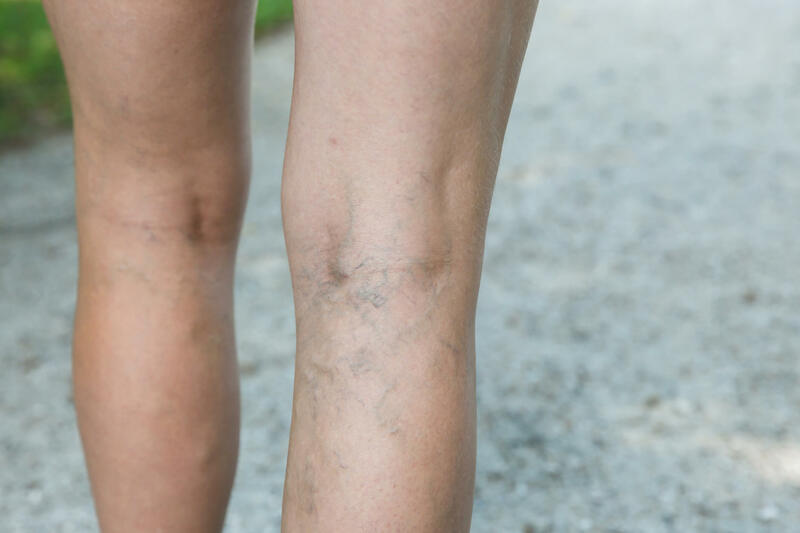 They are called spider veins since they contain the appearance of a spider web. Spider veins are commonly located on the face and legs. Spider veins affect both men and women and are known to affect up to 50% of people worldwide. These webs of small arterioles and capillaries usually look inflamed and are oddly close to the skin, which makes them lose their veracity and suppleness. Spider veins can typically be found anywhere on the body, but are usually found on the nose, cheeks, chin and legs. When you put pressure on the area, they will come into view and vanish, since blood is flowing back into the vessels. The downside to this skin condition is that it can cause humiliation and a lack of confidence in one’s skin. They are hard to cover with makeup, and unfortunately will also be visible even if you wear nylons. Many people are unaware that for many women this confines clothing attire choices on a regular basis. At the end of the day, many people are looking for the best solutions for eliminating spider veins. So here at Mederm Esthetics & Laser in Woodbridge, Vaughan, and Concord, we make beautiful skin happen by providing the best treatments. So for those who have been continuously dreading the sight of their legs, you can say goodbye to your spider vein problems for good. Mederm Esthetics & Laser provides great treatment solutions options, such as; Intense Pulsed Light (IPL), Laser, and Sclerotherapy to efficiently eliminate unwelcome spider veins located on the legs and face. Wouldn’t it be nice to witness broken capillaries vanish? Well, this can be accomplished with non-invasive treatments. IPL and lasers are known for utilizing powerful bursts of light that will eliminate those tiny broken capillaries. In addition, sclerotherapy uses a mixture that scars and disintegrates tiny, noticeable vessels. When IPL is used to care for spider veins, the light produces heat that goes into the veins. This makes the walls of the vein to cave in and develop scar tissue. In due course, these veins will be reintegrated by the body and vanish after several weeks. IPL primarily shapes the lower layers of the skin, versus the top. This permits it to arrive at the spider veins, exclusive of burning the surface of the skin. The IPL device produces pulses of light and when these light pulses target the skin, some of the light energy is transformed to heat. How much heat is produced and in which specific parts of the skin varies upon the wavelengths of light incorporated in the pulses. established treatment that has been used since the 1930s. This procedure that we offer at Mederm Esthetics & Laser in Vaughan, Woodbridge, and Concord is favored as it is endured well by patients with not a lot of soreness and efficient results appear in a few weeks. Electrocautery is a great treatment for congealing very tiny facial veins. The treatment follows a specific procedure, where very tiny electric currents are sent out to the vessel by wire cautery tips—the same type utilized to do electrolysis for hair removal. The wires are then pushed to the surface of the skin, where electric currents are used. It is not uncommon for the vessel to clot, as the electric current goes down the bloodstream by the trail of the slightest defiance. But on some occasions, the fine wire tip will, in fact, pierce the skin to permit the tip contact with the vessel and blood circulating in the vessel. Numerous treatment sessions are recommended and needed for the best results. Last but not least, eyewear MUST be worn during the procedure. Please call or email Mederm Esthetics about our services or to schedule your FREE consultation. We Make Beautiful Skin Happen!